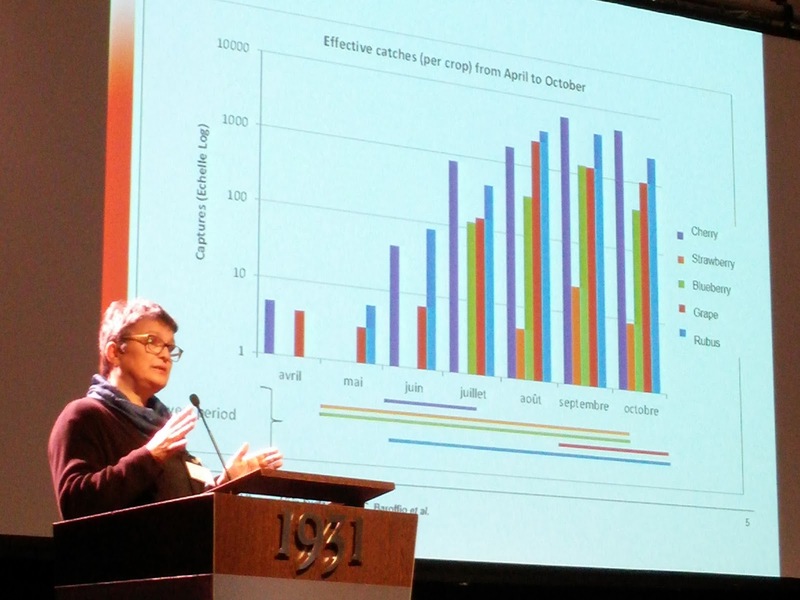 With the current monitoring systems in use, growers and advisors are generally relying on wine and vinegar based blends of liquid attractants to both monitor and catch Spotted Wing Drosophila (Drosphila suzukii) or SWD. The liquids have a short life, as the attractive volatile components dissipate quickly often leaving a sticky gel like substance. These attractants are also not specific to SWD. In some presentations, the entire trap needs to be replaced, creating considerable waste. 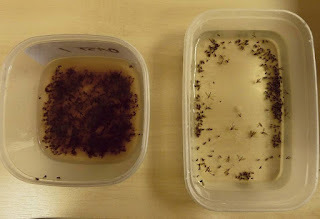 Another problem is that the wine and vinegar blends attract many other insects, so that identifying SWD caught in the liquid can be tedious and messy. Following extensive laboratory and field evaluations in the US, researchers have isolated the key attractant chemical components that are contained within liquids which SWD prefer and in turn, the insect pheromone specialist Trécé Inc has created a novel dispenser that can neatly contain and release the chemicals consistently. 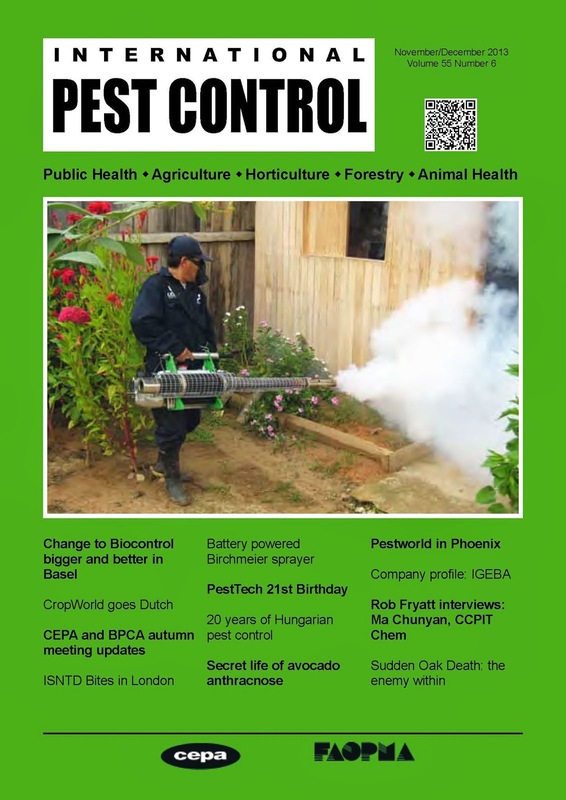 After a few false starts, testing over 2014 and 2015, in both in Europe and the US have delivered great results against commercial standards and now the Trécé product, called the Pherocon SWD Lure is available in the UK and EU markets from Sentomol Pest Management Solutions. 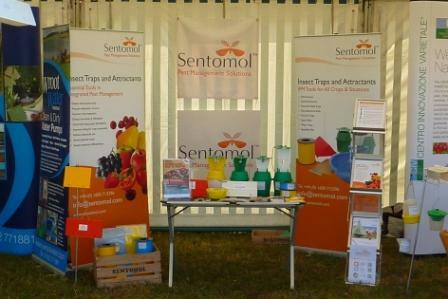 The product was on display at the Sentomol stand and proved a popular discussion at the 2015 Fruit Focus event at East Malling, Kent, 22nd July. With ease of handling a prime consideration, the SWD lure is simply suspended under the lid of the trap before adding a catching liquid. One advantages of the Pherocon SWD Lure is that it can be used with a clear drowning solution, such as with soapy water or antifreeze which significantly aids in the identification of fly capture as well as removing the need to regularly change the liquid bait. In addition, the new Pherocon SWD Lure has demonstrated captures of SWD a good 2 weeks earlier versus natural baits in areas where adults do not overwinter and as the long lasting dispenser will work over 7-8 weeks, there is no need to change baits weekly, saving time and labour. The new lure is also more specific to SWD than liquid baits, attracting far fewer moths, flies, wasps and other drosophila species than a wine and vinegar blend and the capture of SWD is made all the more convenient when the lure is used with the Pherocon SWD Trap which specially designed with wide aperture mesh cover entrance holes to further limit the ingress of non-target insects. More information is available from David Loughlin at Sentomol (01600 713396 info@sentomol.com). PestEx 2015 at the ExCel centre was attended by over 2000 visitors over two days in March. It was a first outing for our new banners. Thanks to Octopus Design in Whitchurch, Cardiff for all their hard work. 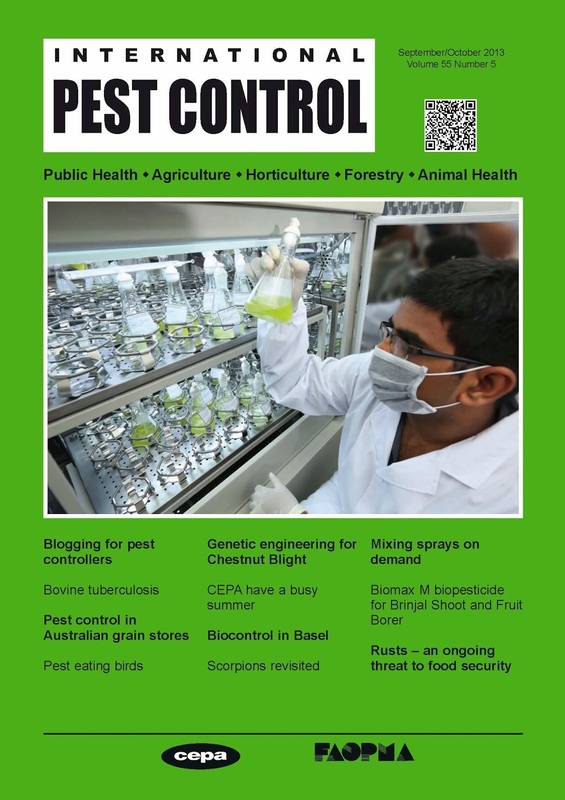 I've been to PestTech many times over my career. 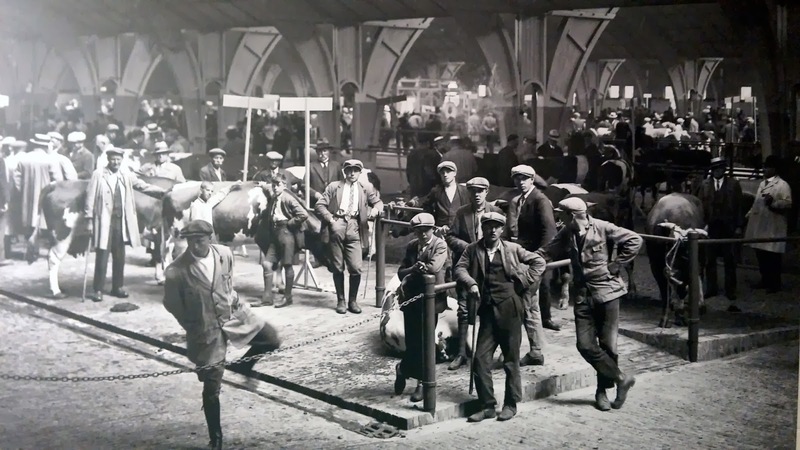 It is the largest one day pest control exhibition in the UK, if not Europe, and is organised by the National Pest Control Technicians Association (NPTA). The equivalent of a pop-up shop for the pest control industry it takes over the National Motorcycle Museum (just off junction 6 of M42 Birmingham) for the day. This year was a first for me to exhibit as Sentomol having been an exhibitor with previous companies over the years. The Horsefly Trap was an instant hit, with most visitors uncertain as to what it was for. 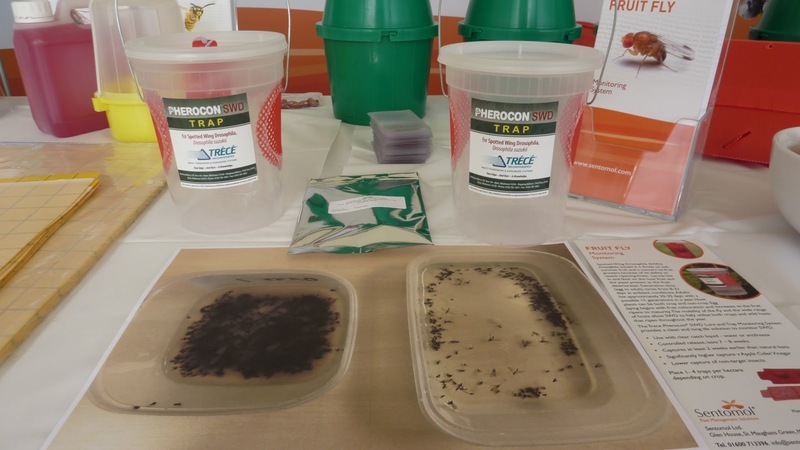 We were pleased to include the range of Trécé Storgard insect monitoring products and especially the new Quick Change range for ease of handling. As always it was a busy and extremely full day. East Malling Research, Kent, on 24 July and hot sunny weather shone on the 1200 visitors that attended Fruit Focus 2013 and Sentomol were again among the 126 exhibitors (a record). 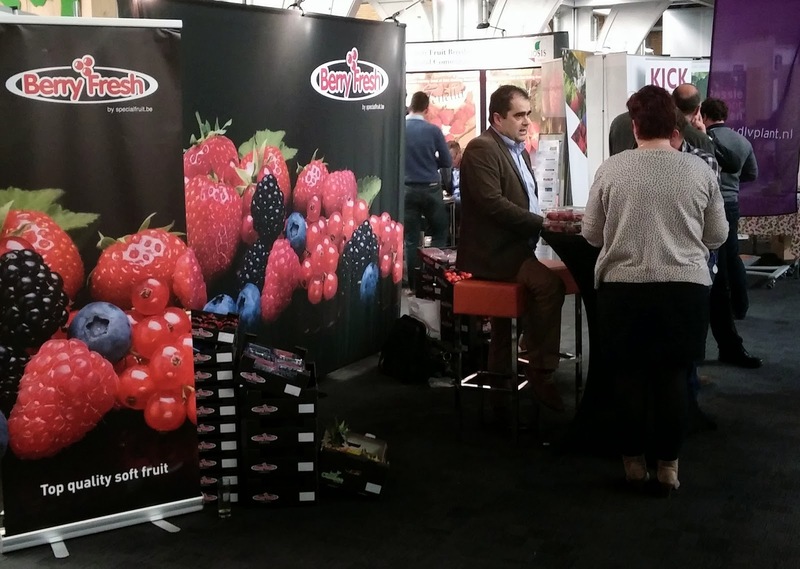 The event provides an great opportunity to keep abreast of the latest developments on show and has become the UK’s leading showcase for the fruit sector. Although this year was the latest ever start to the season, soft fruit continues to be a crop increasing in yield and value. Strawberries this year are giving above average yields, up to 40t/ha while raspberry sales are hitting around 400t per week. 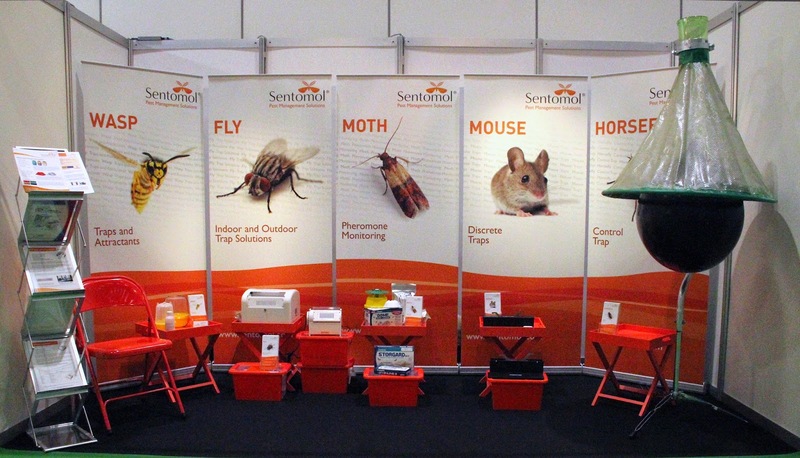 Sentomol was at Stand 66 and our stand saw a continuous flow of visitors over the day. 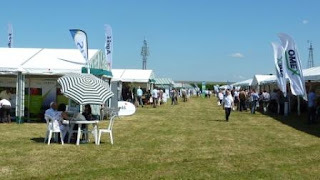 Exhibiting our full range of soft fruit traps for raspberry beetle, raspberry midge, Lygus and Lygocorus and strawberru blossom weevil discussions also covered what was new for Drosophila suzukii. A great second year and we look forward to returning in 2014.